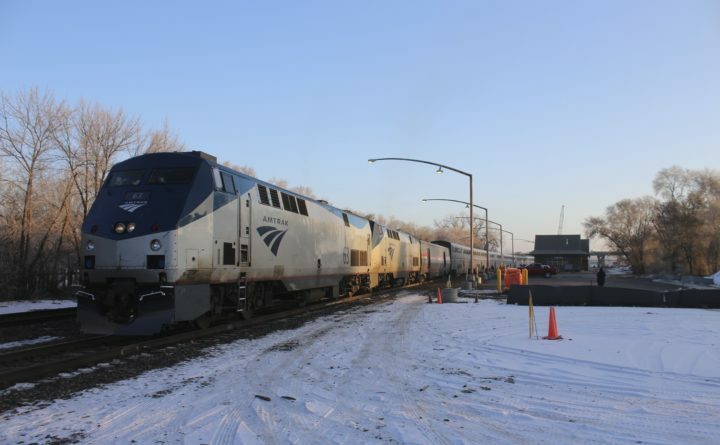 A westbound Empire Builder pauses in Minot, North Dakota, on a run that began the previous afternoon in Chicago and will conclude the next morning in Portland, Oregon. Five months ago, in a scathing report on a 2016 accident in which two track workers were killed, U.S. safety investigators urged Amtrak to slow its trains when they pass work crews. The nation’s passenger rail service didn’t follow the advice and still hasn’t replied to the safety recommendations the National Transportation Safety Board announced in November, according to government records and details released from investigators. Last week, another Amtrak worker was hit and killed in a similar accident in the Washington suburb of Bowie, Maryland. The victim was an Amtrak watchman who was helping monitor safety during track work between the capital and Baltimore when struck April 24 by Train 86. The train was traveling at a high rate of speed and no work-zone restrictions were in place, said NTSB spokesman Peter Knudson. While the NTSB’s investigation will determine how big a factor the train’s speed was in the accident, any time workers are hit on the tracks it suggests a breakdown in the extensive safety procedures required to protect them, Ubaldi said. “If everybody follows the rules — the train engineer, the dispatcher, the roadway workers — nothing like this can ever happen,” Ubaldi, who teaches a course in protecting railroad maintenance workers, said. Amtrak declined to comment specifically about the latest accident because it’s under NTSB investigation. The railroad has been implementing multiple procedures based on NTSB’s recommendations in the 2016 accident, Beth Toll, an Amtrak spokeswoman, said in an email. “Amtrak is currently conducting several quantitative and qualitative risk assessments and will evaluate the inclusion of speed restrictions as a possible mitigation tactic,” Toll said. Most collisions between trains and railroad workers occur at slower speeds, she said. The latest Amtrak accident is one of a string of at least four fatal incidents since December involving the U.S. passenger rail carrier. In its report on a 2016 crash that killed two track workers and injured 39 other people in Chester, Pennsylvania, which was adopted Nov. 14, the NTSB said it had uncovered widespread safety concerns. “Amtrak’s safety culture is failing, and is primed to fail again, until and unless Amtrak changes the way it practices safety management,” NTSB Chairman Robert Sumwalt said at a hearing to adopt the board’s findings on the 2016 accident. The NTSB report identified 29 “active failures and latent conditions” that were threatening safety, ranging from employees who had tested positive for drugs to repeated failures to follow the railroad’s own rules. Amtrak has taken numerous steps to try to address the safety of workers on tracks, the NTSB said in the report. It ordered workers to improve communications when discussing work-zone procedures, issued a bulletin clarifying its protocols and created an independent group to evaluate how the railroad was complying with its rules. Investigators haven’t released any conclusions about Tuesday morning’s accident. A southbound Maryland Transit Administration MARC commuter train was approaching the work zone at about the same time as the northbound Amtrak train arrived on a separate track, Knudson said. The worker was hit by the Amtrak train and killed. The accident prompted lengthy delays to that train and others. The NTSB, an independent agency with no regulatory powers, issues non-biding recommendations to agencies, transportation operators and others after accidents. As of Monday, Amtrak hadn’t responded to any of the NTSB recommendations. Amtrak has had a long and well-known history of issues with work zone safety on its tracks, Cothen said. Whether trains in the area of the latest accident should have been required to pass at slower speeds isn’t clear yet, and such orders can cause train delays that significantly disrupt schedules, he said. Still, such accidents raise numerous questions. The responsibility for safety falls on the work crew as well as Amtrak’s management, he said.